Will be leading the Saturday morning Yoga. Promoting CAAM, meeting great Vaidyas , making new friends & embracing old ones! 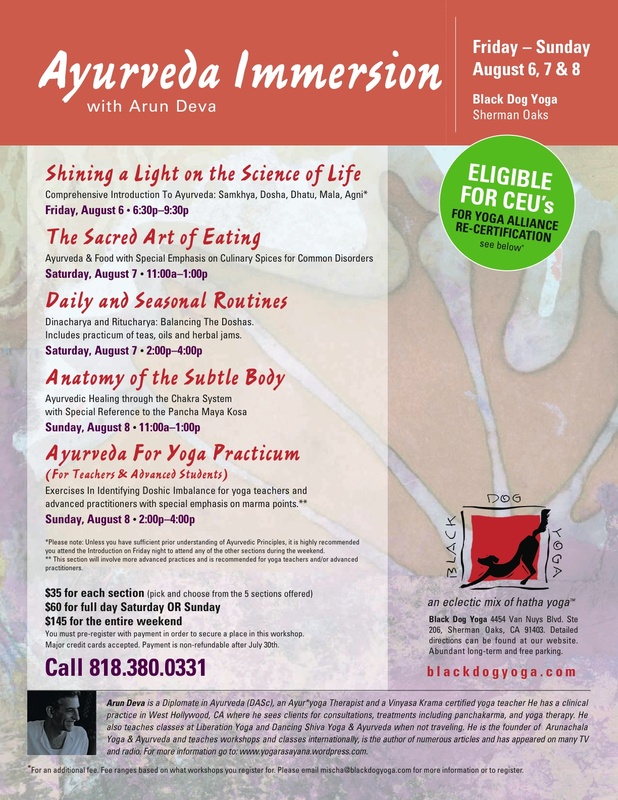 I am once again honored to lead the Ayur*yoga sessions. It has been my privilege to do this for Dr. Lad and Friends Of Ayurveda and I remain deeply grateful to them for their trust. May 3-16: Flow Yoga, Salt Lake City! Ayurveda Immersion for Teacher Training, Workshops, Consultations, Treatments! Workshops, consultations, treatments and panchakarma: Stay tuned! 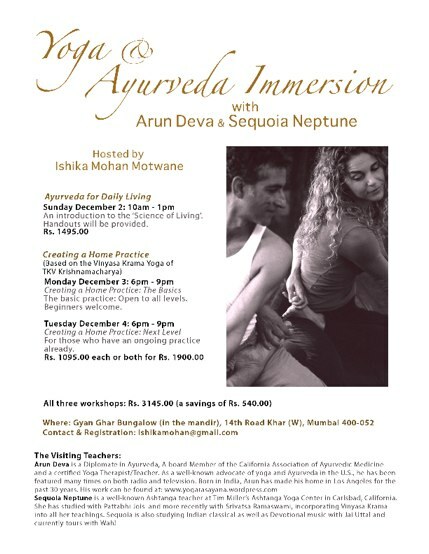 Teacher Training Ayurveda Module, consultations: Stay Tuned! 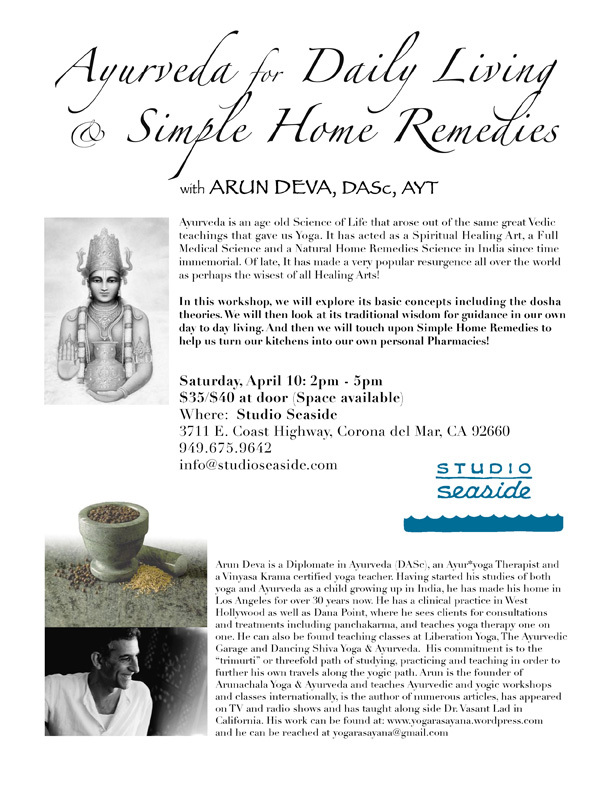 Ayurveda, Yoga & Tantra Chakra Workshop: Stay Tuned! August 8: The Inner Galaxy: Exploration of the Yogic Body:Entering the Kosha, Nadi, Marma and Chakra systems. In this workshop we explore our deepest nature with its 3 bodies, 5 sheaths, innumerable subtle energy channels, their access “trigger” points on our skin and the whirling wheels of consciousness known as chakras! Understanding our inner landscape opens the door to deep healing at the causal, subtle and physical levels. We will utilize the ancient, tried and true therapies of yoga, Ayurveda and Tantra to create a new pathway to Perfect Health. 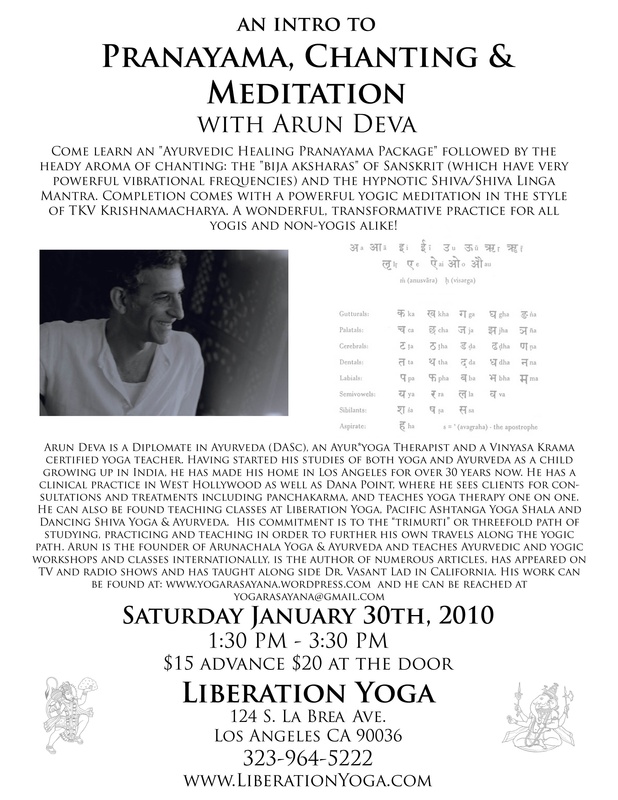 Living Yoga in Temecula, CA. 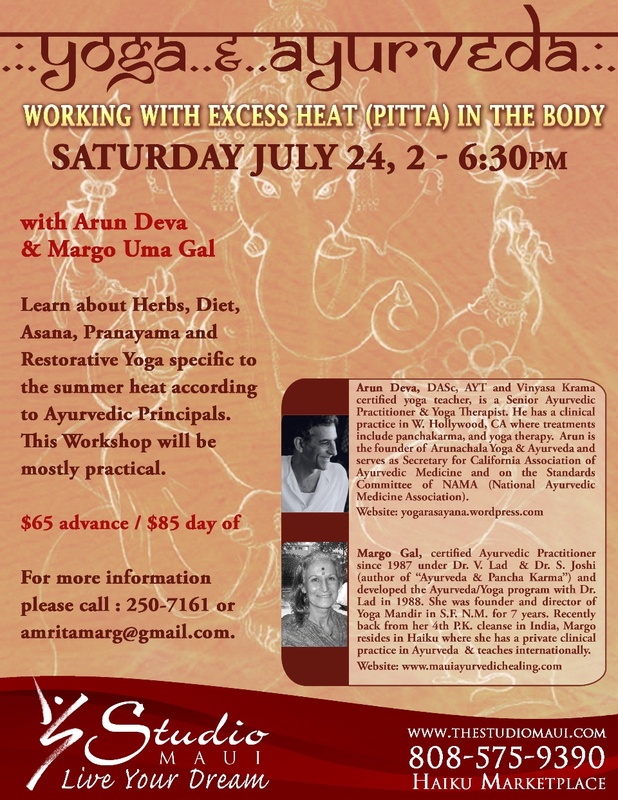 Jul7 25: Healing Consciousness: An Exploration of the Koshas, Chakras, Nadis and Marmas of Yoga & Ayurveda. Using the tools of Yoga and Ayurveda, we will explore consciousness as it descends into matter through five sheathes known as Koshas. Embodied in emotional, mental and physical being, this consciousness is carried in channels of energy called Nadis. These are intimately and functionally connected to the Chakra system from which they originate. They, as well as all other systems in the five sheathes, are accessible on the surface of our skin through energy points known as Marmas (similar to acupuncture meridians). They are the pathways to the “inner pharmacy” of healing. In this workshop we will enter this “inner galaxy” to explore what we really are made of elementally and vibrationally. We will then talk about herbs, gems, mantras, asanas, pranayamas, aromatherapy and other modalities to bring healing to each plane of consciousness. Finally, we will create a powerful practice using these tools to experience positive transformations in our consciousness. Detailed handouts will be provided. In Balance Yoga in Thousand Oaks, CA. The Sacred Body: An Exploration Of The Kosha, Nadi, Marma and Chakra Systems. In the Tantra (evolution of Intelligence), consciousness devolves from vibrational to emotional, then mental and finally physical. These stages are all captured within our Inner Galaxy, as sheaths of existence know as Koshas. In this workshop we will examine these sheaths along with their related systems of Nadis (energy pathways), Marmas (trigger points that lead to the inner pharmacy) and introduce the Chakra system. 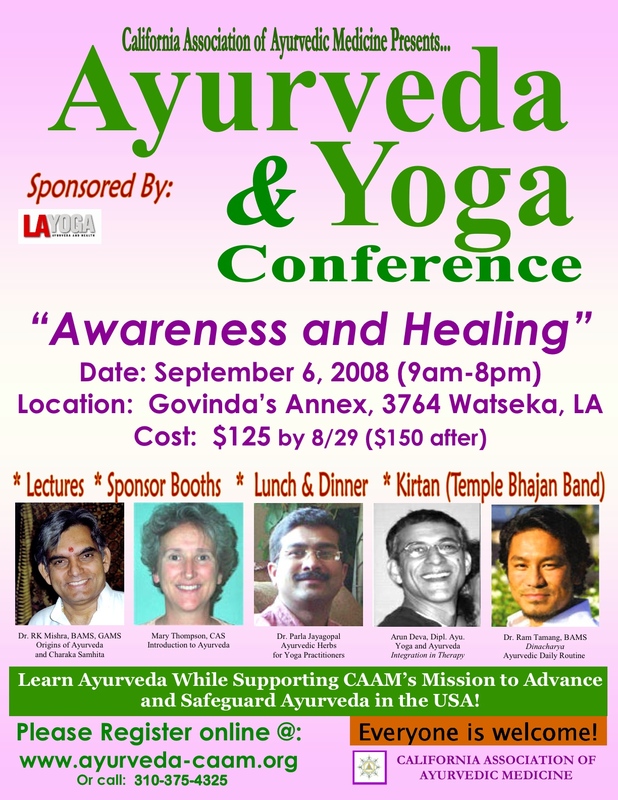 Using the tools of yoga & Ayurveda, our emphasis is on healing our states of consciousness. Detailed handouts will be provided! Healing The Sacred Centers: The Seven Planes Of Consciousness With Emphasis on Healing. 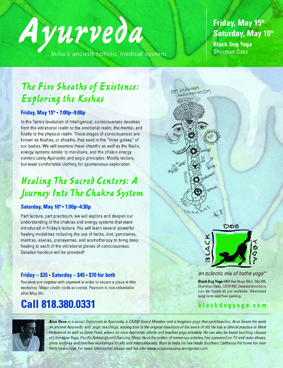 Continuing our journey, we step deeply into the worlds of the chakra system. These wheels of spiraling Awareness are our pathways back to our Divine Nature, hidden deep within us. 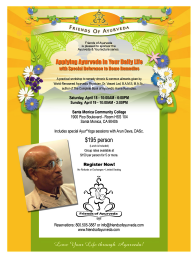 Part lecture, part practicum, we learn about herbs, diet, gemstones, mantras, asanas, pranayamas, aromatherapy and other modalities to bring healing back to each vibrational plane of consciousness. We will then experience the chakras through music as provided by virtuosos Indian musicians, Vikash & Prabhash Maharaj, who will also play a separate concert later that night! A separate, practical detailed handout is provided. Very hands on workshop! 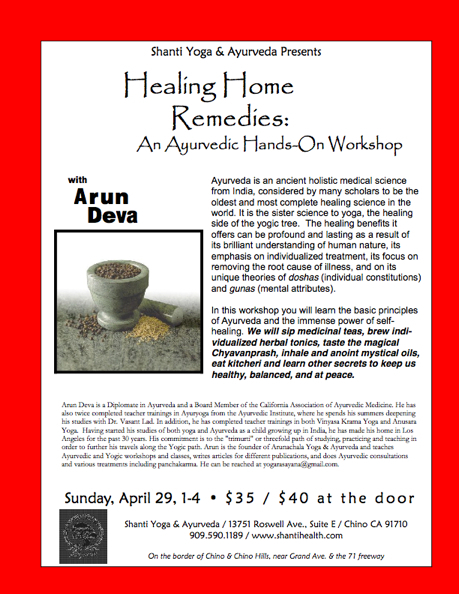 It is highly recommended you take the April 25 workshop, as it will lay the groundwork for this one! SPECIAL EVENT MAY 3 EVENING: INDIAN CLASSICAL CONCERT WITH PANDIT VIKASH MAHARAJ & PRABHASH MAHARAJ! w/special reference to home remedies. 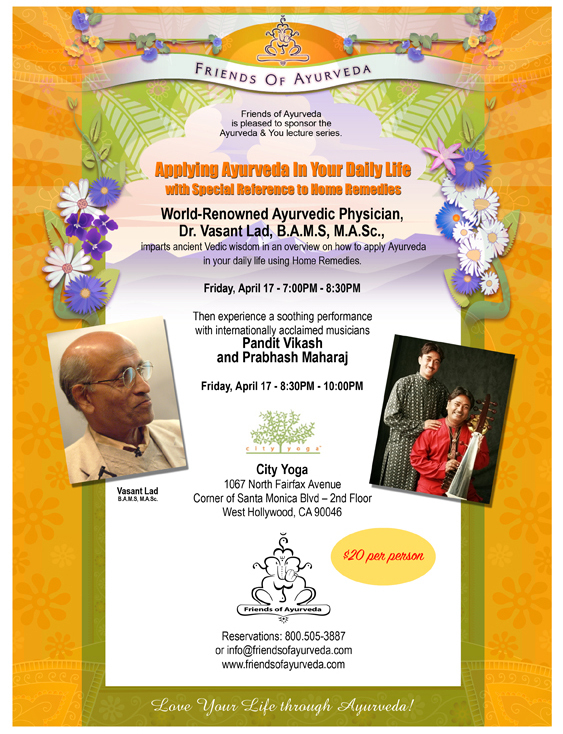 Arun will present the Ayur*yoga segment of Dr. Lad’s weekend program. Now open to all, space available! To sign up for class, please email samatayoga@earthlink.net with your name, phone number and which workshops you would like. Or call 310-306-8845 at Samata. 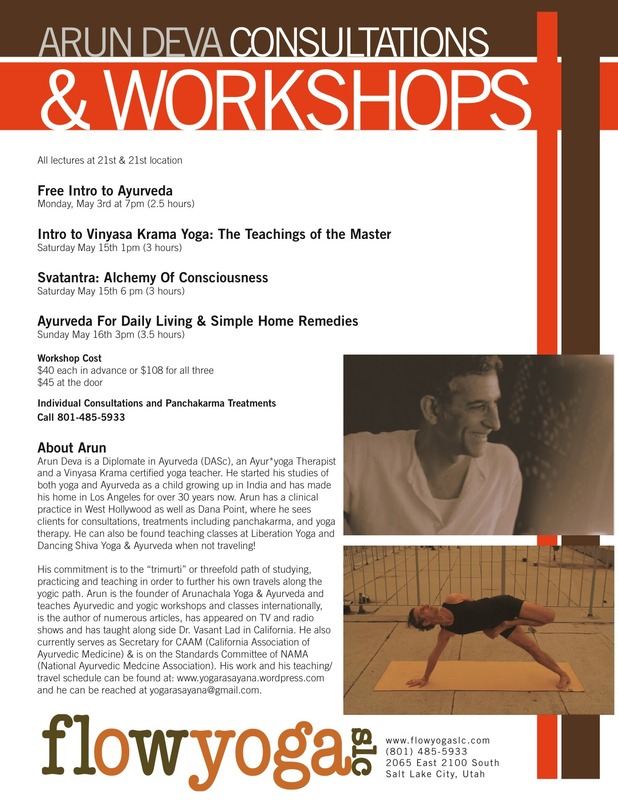 Location for all workshops: Samata Yoga Center, 4150 Tivoli Avenue, Los Angeles, CA 90066. Please see Workshops page for details. Yoga Bungalow, San Juan Capistrano. The Yogic/Ayurvedic concept of the mind consists of a very deep and complex understanding for a science that is at least 5000 years old! Ayurveda has been instrumental in both understanding as well as creating a harmonious mind. 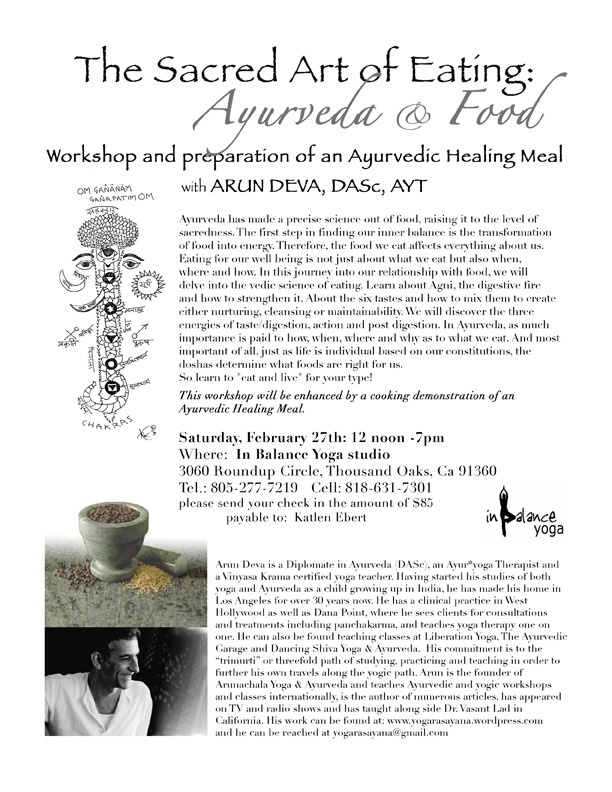 In this workshop, Arun will introduce concepts and therapies arising from both Ayurveda and yoga, giving us practical tools to alter our mental terrain into a positive reflection of the possibilities inherent within us. 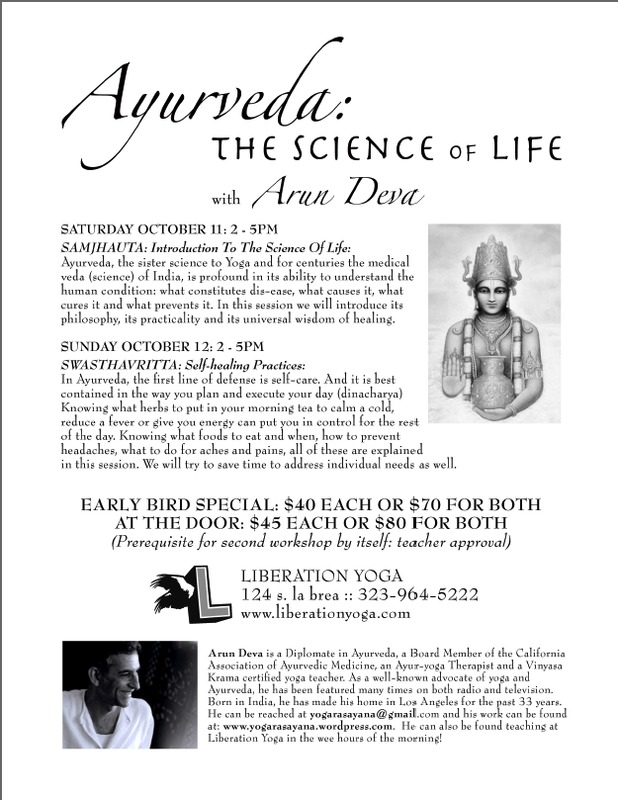 SUN NOV 11 2007 from 2-5 PM: ASANA, PRANAYAMA & CHANTING! with Sequoia Neptune. In this workshop, Arun & Sequoia will lead a Vinyasa Krama practice, followed by a long Pranayama Chikitsa and then Sequoia will lead us all in Ecstatic chanting, Not to be missed! 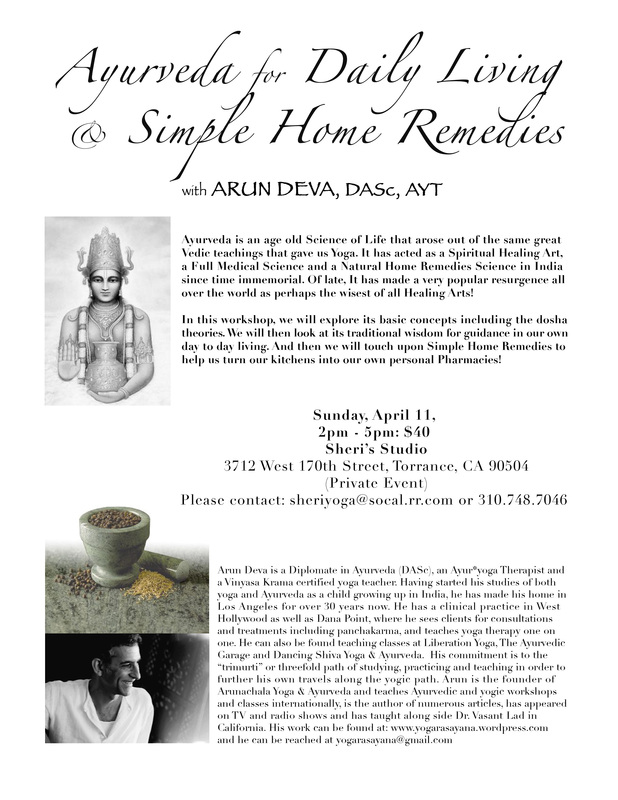 In this workshop you will learn the basic principles of Ayurveda and the immense power of self healing. You will sip medicinal teas, brew individualized herbal tonics, taste the magical Chyavanprash, inhale and anoint mystical oils, eat kitcheri, and learn other other secrets to keep us healthy, balanced and at peace.